The NYS weather station on the Sanfordville Elementary School campus is funded entirely through FEMA’s Hazard Mitigation Grant Program, with no cost to taxpayers. 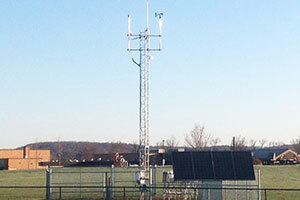 The Warwick Valley CSD recently began participating in the New York State “Mesonet Early Warning Weather Detection System,” an advanced statewide weather station network. This network will be first of its kind in New York State, and consists of up to 125 surface weather stations that will detect weather phenomena across the state. Each of the 125 Mesonet weather stations will measure surface temperature, relative humidity, wind speed and direction, precipitation, solar radiation, atmospheric pressure, as well as soil moisture and temperature at three depths. The weather station, located on the Sanfordville Elementary School campus, will support more accurate, more precise decision-making in agriculture, emergency management, energy, ground transportation and aviation. The project is now completed and fully functional. The Mesonet’s weather stations provide localized, accurate and timely data on air, soil and radiation conditions. The data will be made available to our students to enhance an educational understanding of weather and will allow more accurate prediction and monitoring of various weather conditions. “Having a weather station in our district is a wonderful opportunity for our students and community, and the data it provides will have a statewide benefit,” said Timothy Holmes, Assistant Superintendent for Business.